There are certain places in Second Life to which I always enjoy making a return. One of these is Binemist, Biné Rodenberger’s Homestead region, which changes as the mood or season takes her, and which has long been a particular favourite of mine. I was therefore surprised to realise that it is actually more than a years since I last blogged about it, and almost a year since I last dropped in. Those familiar with the region (you can also read about it here, here and here if not) will know it has traditionally been a water region – one of the reasons it has always endeared itself to me. However, in its new iteration for the start of 2016, this is no longer the case: Binemist has become a desert landscape. “I love the colours, and I love the early morning sun,” Biné say of the new design, and I have to admit it is dramatic: an iron flat expanse of sand bounded by mountains on two sides, and across which are scattered a series of scenes visitors are invited to explore as crab-like robots skitter across its sandy surface. Two of these, located south of the landing point, are dwellings: a stone-built house with its own lush garden, complete with an attempt to cultivate a carpet of grass beyond its high walls, and a converted shipping container sitting among a collection of its peers (which also features a most unusual and adult take on a playground ride!). It is alongside these two homes that the otherwise flat expanse of the land is broken by a rocky upthrust of rock offering two plateaus linked by a stone span. Northwards, across the sands from these, sits a little vignette visitors to Binemists Past will likely find familiar: the Buddha and floating eye, a gathering of pink flamingos, a grouping of mystic stones with an ethereal floating spire nearby and, standing at the very edge of the region while staring off to a distant horizon snuggled between the mountains, Bryn Oh’s White Balloon. Also, Just off sim to the east sits the familiar form of the wrecked Viking ship which has always been a motif got the region, while over in the north-west corner of the region sits Haveit Neox’s Ship of Fools. In addition to the ground level layout, the landing point offers two teleport portals to skyborne locations. The first of these is the sky rock which used to be the landing point for the region, where sits a rural scene reached by a teleport hole set in the ground. The second is a skybox set out as the interior of a house, where Biné experiments with interior design, and which is reached via a teleport door. The new Binemist is very different to past iterations, and even though I perhaps miss the water and what could be found beneath it, there is a wonderful, desolate beauty about the new design which is equally as attractive and photogenic. And for the adventurous, there’s also the opportunity to ride around the sand in a novel little “bubble car”! Monday, February 29th 2016 saw HTC / Valve open the doors for pre-ordering of the consumer version of the Vive VR headset, while Microsoft started accepting pre-orders for the Development Edition of the AR / mixed reality HoloLens system. The first batches of each system are expected to start shipping around the same time as Oculus VR commences the first shipments of the Rift headset, which was made available for pre-order in January: the Rift is expected to start shipping on March 28th, world-wide, with the Vive starting on April 5th, also world-wide (although the latest update on the UK order page now states shipping will be in May 2016, possibly as a result of initial order received). The HoloLens will commence shipping on March 30th – but only to developers in the USA and Canada. HTC initially announced the US consumer price for the Vive – US $799 excluding sales and shipping – on Sunday February 21st. This is some US $200 more than the Oculus Rift, but the prices does includes two wireless hand controllers; Rift buyers will have to purchase similar controllers separately, either from a third-party or through Oculus VR when their Touch system launches some time in Q2 2016. While no prices have been confirmed for the latter, many are taking Palmer Luckey’s comments that bundling Touch with the Rift would have “significantly” raised the price of the latter to mean that Touch is liable to cost between US $100 and US $200 – markedly closing the gap between the two systems. On February 28th, 2016, HTC further announced the Vive’s international pre-order pricing. This see the Vive pitched at £689 (around US $960) in the UK and €899 (US $977) in Europe, both inclusive of VAT but exclusive of shipping costs (£57.60 for UK customers). Customers in Canada can expect to pay CAD $1149 + tax and shipping. The Vive package includes the headset, which has a similar technical specification to the Oculus Rift (but with a 9:5 aspect ratio rather than 16:9, the former being said to result in a more natural and convincing “feel” to images on the headset’s screens), the two wireless controllers, a pair of Vive base station sensors, a Vive Link Box, and a pair of Vive ear buds. For a “limited period” pre-order units will additionally ship with two free VR games: Job Simulator: The 2050 Archives and Fantastic Contraption and will also include Google’s Tilt Brush VR painting system. As an added sweetener for developers, and as reported by Tech News World, Unity Technologies has announced their game platform will have native support for the HTC Vive and Steam VR, while Valve have introduced an advanced rendering plug-in developed for Unity. There is also a Vive Developer’s portal, which includes support for Unreal Engine. 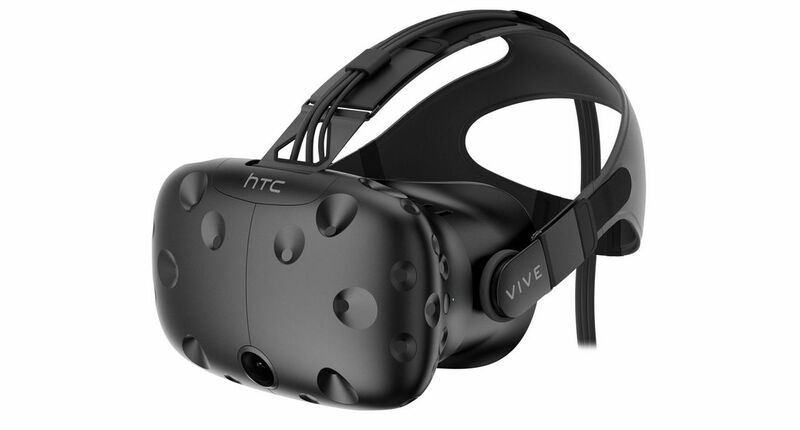 The computer hardware specifications for the Vive also pretty much resemble those of for the Oculus Rift, and like Oculus VR, Steam are offering an application that potential purchasers can download to test whether their PC is “VR ready”, while HTC offer a page of recommended PC hardware suppliers who can provide “Vive optimised systems” to US customers. As I reported in January, the headset includes two interesting additions. The first is the front mounted “pass through” camera, which allows the user to see an overlay of the room around them projected into their virtual view. This fades in if they approach a physical object (e.g. a wall or desk, etc. ), or can be manually triggered via the hand controllers, and allows for collision avoidance when using the headset with the room sensors to move around within a VR environment. The second is “Mura correction” (“mura” being a Japanese term meaning “unevenness” or “lack of uniformity”), which removes the inconsistent brightness levels between one pixel and the next on earlier Vive headsets, presenting a far more uniform and cleaner image. Further information can be obtained from the HTC Vive pre-order website and via Valve’s Steam website.